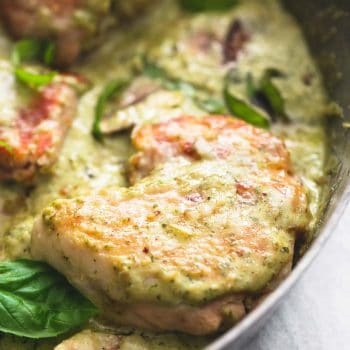 In 30 minutes you can whip up this one-pan and flavor-packed creamy pesto parmesan chicken. Grease a large skillet and cook chicken over medium heat 5-8 minutes on each side until browned on the outside and cooked through. Transfer to a plate and cover to keep warm. Add garlic and mushrooms to pan and saute over medium heat til garlic fragrant and mushrooms are tender, about 3-4 minutes. Add pesto to pan and saute 1-2 minutes. Add chicken broth and stir to combine with pesto. Add cream and continue to stir over medium heat until sauce is smooth. Add parmesan cheese and stir until melted and combined with sauce. Taste and add salt and pepper if needed, to taste. Return chicken to pan and toss in the sauce to coat. Sprinkle additional parmesan cheese over the chicken and garnish with fresh basil and serve.